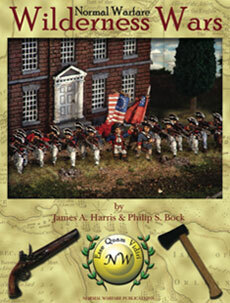 Wilderness Wars is a rule set for gaming historical miniatures. It is meant to simulate company and battalion-sized conflicts in the eighteenth-century and early nineteenth-century. Through the course of gaming the period for several years, it became apparent that no current set of rules on the market accurately simulates the medium-sized conflicts of the period. Most rule sets designed for colonial warfare in this period concentrate on skirmish-level actions representing no more than several hundred men in each force. Meanwhile, rules designed for eighteenth-century European warfare are meant to simulate battles on a much larger scale than was typically found outside of Europe at that time. Wilderness Wars strives to provide rules specifically designed for scenarios in which the opposing armies typically numbered anywhere from 500 to 10,000 men each while maintaining the unique flavor of Wars in the Wilderness. Our 2nd Edition (coming soon) works on cleaning up the design of our initial venture, and establishes faster gameplay without sacrificing historical accuracy and realism. We’ve also worked to improve the legibility and simplicity of the cheat sheets as well as to create new and exciting scenarios.